A screenshot of Color TV-Game 15. The Color TV-Game 15 (カラーテレビゲーム15, TV-Game 15) was one of the consoles of the Color TV-Game line, acting as one of Nintendo's first forays into the video game industry. The Color TV-Game 15 console. The Color TV-Game line of consoles was a series of consoles produced by Nintendo in the late 1970s, with all consoles only being released in Japan. The Color TV-Game series was among the numerous Pong clones produced after the production of Pong by Nolan Bushnell's Atari in 1972. The Color TV-Game 15 was the second iteration of the console, released in 1977, it featuring fifteen game variants over the six offered by its predecessor. The paddles move in linear paths with the same consistent speed, in homage to how the original game was controlled by using microswitches. The Color TV-Game 15 made its Smash Bros. debut as an Assist Trophy in the fourth game of the series. Upon being summoned, a single white paddle appears above the summoner's head, before splitting into two paddles from the original game. It will then launch a large pixel "ball" between both paddles, playing a game of Pong by themselves. The launched ball will bounce off any surfaces it touches, and deals extreme knockback to any enemy that touches it directly; reflecting a ball in play often grants it OHKO power. Additionally, the paddles themselves reflect projectiles for the opponents of the summoner and deal knockback to enemies that touch the paddles, while not inflicting any damage. During the "game", an aesthetic score appears above each paddle, keeping track of how many wins each paddle has. The paddles will attempt to keep the ball in play as long as possible; if one paddle gets a point, the other paddle with shake up and down in dismay before another ball is launched. Due to this Assist Trophy's color palette, the ball and paddles can be almost impossible to see on white stages, such as the alternate version of Dream Land and the transitions of Reset Bomb Forest. In Super Smash Bros. for Wii U, from the Super Smash Bros. Direct. The Color TV-Game 15 trophy appears in both versions. In Super Smash Bros. for Nintendo 3DS is a Challenge reward, obtained by playing 50 combined hours in the Smash mode. In Super Smash Bros. for Wii U it is part of the Memorabilia Trophy Box. Nintendo released this video-game console way back in 1977. You could play 15 different games, inspired by sports like tennis and hockey. In Smash Bros., paddles will appear on the left and right sides of the stage. You can hit the ball, but avoid touching the paddles at all cost! In 1977, Nintendo released this home video game system in Japan with 15 variants of games like tennis and air hockey. 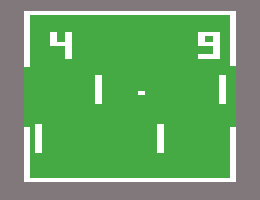 In this game, the paddles appear at the sides of the stage, and a game of Tennis B starts. The ball can launch fighters on its own, but don't touch the paddles either! Color TV-Game 15 reappears as an Assist Trophy. When summoned, the background of the current stage is now completely dulled out to resemble the graphics of the original game, as well as increase visibility. It can be defeated by attacking the paddles. Training Mode describes the Assist Trophy: Starts a rally with two paddles and will also reflect any projectiles that hit them. Released in 1977, the console currently acts as the oldest entity in the Super Smash Bros. series, being three years older than Mr. Game & Watch and Pac-Man's debuts in 1980 and 2 years older than Sheriff. As such, it is also the oldest Assist Trophy in the series, beating Devil since Super Smash Bros. 4. Color TV-Game 15 is the only Assist Trophy in the entire series to not have a Spirit in Super Smash Bros. Ultimate. Despite this, it is still featured as an Assist Trophy enemy for a few spirit battles. This page was last edited on April 17, 2019, at 04:32.